The White House said Wednesday there was no danger of an imminent attack on airplanes after reports that terror groups were mulling implanting bombs into the bodies of passengers. The assurances came after news that the US administration warned airlines that extremist groups were considering surgically implanting explosives into people to try to beat tight airport security measures. Passengers flying to the United States could now face even tougher screening measures, a spokesman for the Transportation Security Administration, Nicholas Kimball, told the Los Angeles Times. “These measures are designed to be unpredictable, so passengers should not expect to see the same activity at every international airport,” Kimball said, adding existing methods could not detect plastic explosives under the skin. In the meantime, ever more restrictive airport boarding regulations seem a certainty, and ever more intrusive searches, until we figure out that we have no choice but to identify who is more likely to have evil intent, and give them more scrutiny, because we surely don’t have the resources or the time to give the necessary scrutiny to everyone, including your grandmother in a wheelchair from Peoria, or Trenton, who may choose not to visit you next Christmas due to a distaste for body cavity searches and x-ray glasses (like the ones they used to sell in D.C. Comics, except these will work) in the hands of prurient security types. Sooner or later, someone is going to figure out how to make high-explosive dentures and hip/knee replacements. While Christian “fundamentalists” will be getting only fluoride treatments, young adult male Islamic fanatics will be lining up to have all their teeth pulled and get dental implants made of enamel coated plastique. I predict an influx of wealthy foreign nationals, of Islamic extraction, into European schools of orthopedic surgery, particularly focusing on lower extremity joint replacements. Our too-faithful recent oral surgery patients, who will not have flossed much, will enter airplanes with a slight limp. It’s tough to recover from double knee/double hip transplants, especially when it hurts to eat. The other passengers will feel sorry for them, briefly. Eventually, the only people on airplanes will be strip-searched people with no scars, who just endured body cavity searches and had their stomachs pumped. But they will be very, very safe, wearing their airline-issued flying uniforms. When they land at their destinations, they will report to the changing room/luggage area, where they’ll get their clothing back, which was sent in a transport plane. Cost of a ticket from L.A. to Phoenix? About $1,000. Coming up next: explosive hair. There has already been at least one other report of terrorist plans to implant bombs. We’re moving way past having to look for bombs in your Nikes and Fruits of the Loom. So what can we do about this? Will we carry the no-profiling policy to such a ludicrous extreme that random strip searches are going to be made to look for recent surgical scars, and then require CT Scans in the indicated area (and if that isn’t revealing, we can always have a team standing by for exploratory surgery, just to be sure…. brought to you by Obamacare, of course)? Should we just reject anyone with recent surgical scars? That’ll be tough on the envirobabe groupies with recently acquired, uh, enhancements to the gifts of nature. Instead of flying first class to the next climate change seminar so they can mingle with rich Goreaphiles (in search of suitable husband material among the ecopagan intelligentsia, of course), they’ll have to stay home and watch it all on Skype… or worse yet, on Youtube. But hey…. that’s better for the environment anyway. And who knows what the nice Egyptian surgeon with the funny name inserted besides a little silicon… Maybe there’s a reason something felt a bit lumpy (did he show you the photos from his relaxing summer vacation in the mountains of Pakistan?). We’d better keep all well-endowed ladies off the planes, just in case… unless, of course, some self-sacrificing TSA official wants to check them all, one at a time. I think I have an idea. We can’t profile for ethnicity/nationality/religious background, so says the great Ozbama from behind the curtain (he’s just clandestinely checking up on those TSA officers, his version of Undercover Boss). But here’s what we can do, and indeed there is a tie-in with Obamacare’s plan to computerize all medical records for “efficiency.” Let’s just have everyone fill out a questionaire at the airport on all recent medical procedures. Let’s get a new generation of scanners going that can detect surgical scars. And let’s have computer software that compares the results of the questionaire, the scan, and the complete medical/surgical record that will be online for everyone (obviously, this will give the Obama administration the pretext it needs to extend Obamacare into the entire middle east, parts of Africa, Indonesia, and other Islamic regions. Hope and change.). If there is a scar or a mention of a procedure that isn’t on the “universal medical record” for each individual, we yank the offender out of the queue for “special processing.” Allah alone knows what that might entail. I think I don’t want to know. “Interaction with passengers,” eh? How will a “pat down” locate a surgically implanted bomb? I’m guessing the terrorists have already done dry runs by inserting passengers with recent surgical work (maybe even something benign implanted internally), just to see how well it works. “Enhanced tools and technologies”? Hmm…. maybe TSA has developed the tricorder. Staying home is looking better and better. With Skype, Youtube, Netflix and satellite TV, what else do you need? International travel is over-rated, anyway. You can only tolerate being referred to as the “ugly American” so many times, and everyone knows the world hates America…. that’s why they all want to come here. It would seem that Al Gore is winning converts all over. Tragically. A 7-month-old baby survived alone for three days with a bullet wound in its chest beside the bodies of its parents and brother, who died in an apparent suicide pact brought on by the couple’s terror of global warming, the Argentine press said Saturday. The incident, reported by the daily Clarin, occurred in a modest dwelling in the city of Goya in the northeastern province of Corrientes, where Francisco Lotero, 56, and Miriam Coletti, 22, lived with their two small children. According to sources cited by the Buenos Aires morning paper, the couple’s neighbors smelled a strong odor coming from the Lotero’s house on Thursday. Police entered the home and found a Dantesque scene: the lifeless bodies of the couple, each shot in the chest, and their 2-year-old son, who had been shot in the back. In another room, police found a 7-month-old baby still alive but covered in blood from a bullet wound in the chest. It was taken to hospital immediately and its condition is improving hourly, according to doctors’ reports. The cops found a letter on the table alluding to the couple’s worry about global warming and their anger at the government’s lack of interest in the matter. Obviously, these tragically misguided parents hadn’t heard that Obama was elected in 2008, which means that the sea levels won’t be rising after all. You probably won’t see any coverage of this in the US media, although if the suicide note had said the parents were worried about the socialist takeover of the entire Western Hemisiphere, led by the US, the suicide/murder would probably be blamed on talk radio… and maybe Sarah Palin. The University of Tennessee has announced it is going to award Al Gore an Honorary Doctor of Laws and Humane Letters in Ecology and Evolutionary Biology because according to University Chancellor, Jimmy Cheek, “Vice President Gore’s career has been marked by visionary leadership, and his work has quite literally changed our planet for the better”. The Culinary Institute of America should nominate Hannibal Lechter for an Honorary Doctorate in the Culinary Arts for his “passionate dedication to exploring new culinary possibilities combining fava beans, chianti and human organs”. The Harvard University, Kennedy School of Government should nominate Julius and Ethel Rosenberg for an Honorary Doctorate in International Development for their “unswerving commitment to world peace through open international trade and free exchange of technology”. The USC School of Cinematic Arts should nominate Larry Flynt for an Honorary Doctorate in Film & Television Production for his “body of work celebrating group copulatory interpretive movement”. Fuller Theological Seminary should nominate Madelyn Murray O’Hair for an Honorary Doctorate in Practical Theology for her “lifelong activism related to the subject of the theological equivalent of the unified field theory”. The Claremont Graduate University, Peter F. Drucker and Masatoshi Ito Graduate School of Management should nominate Bernie Madoff for the P.T. Barnum Honorary Doctoral degree in Financial Engineering for his “proven commitment to wealth redistribution and contributions to the Obama model of economic justice”. As for the University of Tennessee I only wish they had their tongues firmly planted in the esteemed Chancellor Cheek. In light of recent disclosures concerning the reliability of anthropogenic global warming data the truth of this latest accolade for Al Gore is more bizarre than anything that could be imagined. Elderly burn books for warmth? If I were a cartoonist I’d draw Al Gore giving a speech on global warming somewhere outdoors. In every frame of the cartoon he’d have to pause his speech and put on another layer of clothing as the weather worsened and the temperature dropped. The last frame would show him so bundled up that he could neither be seen or heard. …..Hey, a guy can dream, can’t he? UPDATE: I was taken to task over this original post. Here is an example of one critical comment. There are others. But your claim that a cold winter is “evidence” against global warming is downright foolish, and shows either a) an interest in misleading people, or b) a blatant misunderstanding of climate change research. Now watch this archival footage showing a series of Democrat politicians claiming that a warm winter and lack of snow was concrete evidence of global warming. Which just further underlines the fact that a) a double standard exists, and b) those who think anthropogenic global warming exists do so as a matter of belief rather than of fact. It’s almost a climate religion. Powerline has a nice summary of the latest attempt of the political “scientists” to convince us that every single weather phenomenon is caused by “climate change”, the meaningless term whose usage has replaced “global warming” in many quarters, due to the inconvenient truth that the warmest year of the last 100 was 1934, and the second warmest was 1998. Here’s more information on the very serious and eminent scientists who demur to the group think, politically inspired conclusions of the eco-panic Left. As always, you have to read the fine print in the studies to learn the truth, and you have to ignore the summary and conclusions that make it into the press. Powerline has a nice deconstruction of the latest. 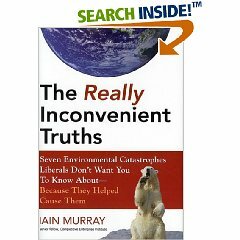 Here is a new book that exposes the really, really inconvenient truth behind eco-panic myths about the environment, and what the real effect of many “environmental policies” has been. Who is the inspiration behind the single biggest human caused environmental catastrophe, causing the most preventable death, of the 20th Century? Al Gore’s heroine, Rachel Carson, with her crusade against DDT, the use of which would have saved tens of millions of lives taken by malaria, but which was banned due to her efforts, and a sycophantic crowd of Gore’s predecessors in the eco-panic movement. Yep: Al’s in fine company. This book is a needed corrective for the total collapse of the media’s reporting in the area. …a case for recent warming can be made based on the tree-ring record, but the recent warming is paled by many past events including many red-hot summers in Finland 7,000 years ago. If nothing else comes from their figure, be keenly aware that climate always changes – flat line periods simply do not exist! In other words, sure, the climate is changing… again. It always has. But those changes have had nothing to do with human inputs, and current changes (which are overblown according to many experts) probably don’t have much to do with humans, either. Reason Magazine – Will Humanity Survive the 21st Century? They’re having a conference on whether they’ll be around next century. My biggest fear is this. I already see the signs….. Wait: I thought the debate was over! JustOneMinute: How Green Was My Scientific Consensus? The American Physical Society, an organization representing nearly 50,000 physicists, has reversed its stance on climate change and is now proclaiming that many of its members disbelieve in human-induced global warming. The APS is also sponsoring public debate on the validity of global warming science. With this issue of Physics & Society, we kick off a debate concerning one of the main conclusions of the International Panel on Climate Change (IPCC), the UN body which, together with Al Gore, recently won the Nobel Prize for its work concerning climate change research. There is a considerable presence within the scientific community of people who do not agree with the IPCC conclusion that anthropogenic CO2 emissions are very probably likely to be primarily responsible for the global warming that has occurred since the Industrial Revolution. Since the correctness or fallacy of that conclusion has immense implications for public policy and for the future of the biosphere, we thought it appropriate to present a debate within the pages of P&S concerning that conclusion.